Crumpets © Sue Todd 2015. I can remember vividly sitting round an open fire on a cold winters day with my grandmother toasting crumpets for tea. She had an old hexagonal sewing table which she used to move in front of the fire, cover with a table-cloth and set out cups and saucers, plates, jam and cakes and we used to enjoy a lovely tea by the fire, toasting the crumpets over the coals with a toasting fork. Dripping with real butter (in the days before margarine came along and ruined things for a while) and topped with home-made jam full of fruit and flavour. I used to love going there after school and would often ‘skip’ the bus home to go there instead and then be collected later. 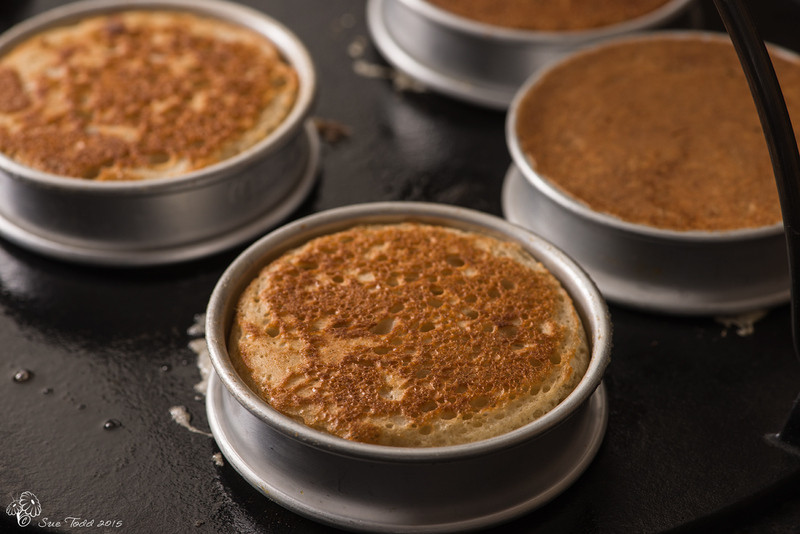 Crumpets are always associated with the Victorian era, but according to Wikipedia they may date back to the Anglo-Saxons when John Wycliffe mentioned ‘crompid cake’ in 1382. The ones you buy in packets are a far cry from ‘real’ crumpets, you just have to look at the ingredients on the packet and the sell-by date that tells you they are packed with preservatives. They are actually quite easy to make and fun. If you make a batch they can always go in the freezer and come out as you need them, either pulling them from the freezer before bed so they are ready next day or defrosting them in the microwave. Defrosting food or heating coffee I’ve forgotten about are the only things I use the microwave for, oh, and if the AGA is off it may see some use – but generally only to reheat something from the freezer. 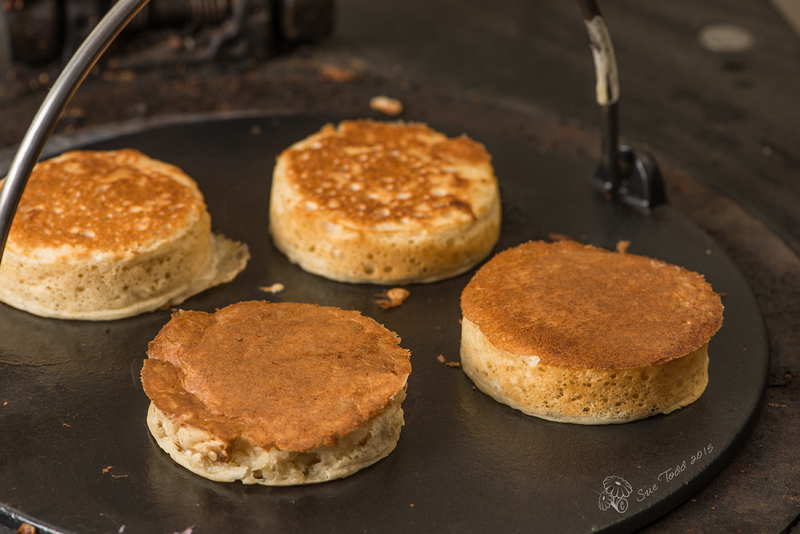 You’ll need crumpet rings for this and either a griddle or a very shallow heavy based pan that you can access easily. I have a very old griddle given to me by my Nan many years ago, but we were lucky enough to be given a brand new AGA one for Christmas which I just want to use, use and use again. Put the flours and yeast into a bowl and mix well. Warm the milk and dissolve the sugar in it. Add this into the flour/yeast mixture in your bowl and beat it until it forms a smooth batter. Alternatively use an electric hand whisk to achieve the same effect. 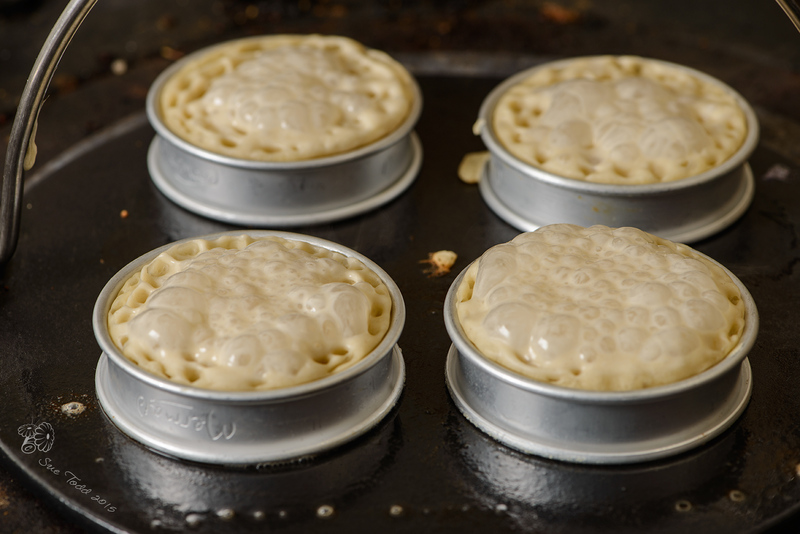 Your batter will have to be really smooth if you want it to produce the customary holes in your crumpets. Pop a cloth over the bowl and leave it for between 20 minutes to an hour. The batter needs to rise and then start to fall again. Mix the bicarbonate of soda and the salt into the warm water and then beat this into your batter a bit at a time. You need to keep adding it until you get a liquid the consistency of double cream. Cover this once again and leave it for a further 20 minutes. Next heat a griddle on a medium heat. If you don’t have a griddle then a heavy based shallow pan will do just as well. Grease the insides of your crumpet rings and add <<<< to the griddle to melt. Pop the rings on the griddle. Drop a couple of dessert spoonfuls of batter into each ring. Bubbles will begin to rise, appear at the surface and set, this will take around four to five minutes. Flip them over carefully to cook the other side, leave them to cook for about 2-3 minutes. Lift off carefully and remove from the rings. Repeat until you’ve used up the mixture, either keeping these ones warm until you’ve finished if you intend to eat them straight away or pop them on a cooling tray for later. Either eat when ready or toast later and serve with lashings of butter! 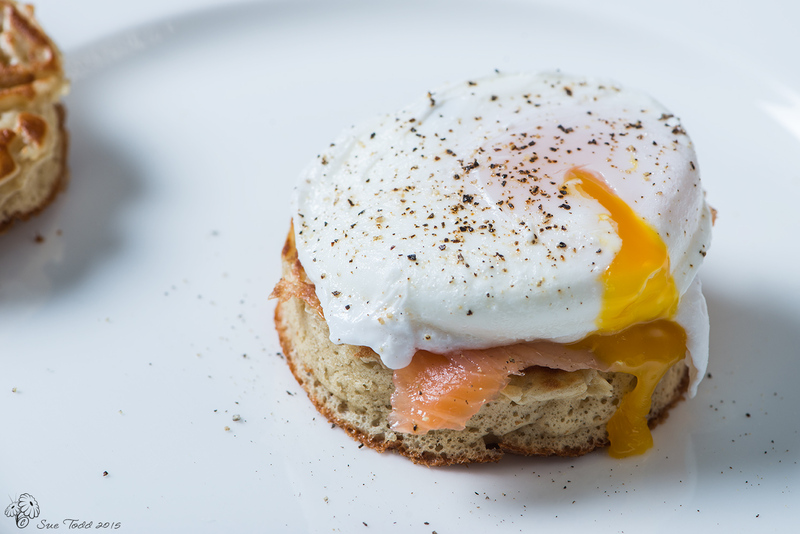 Home-made crumpets with smoked salmon and poached egg.© Sue Todd 2015.
or as part of a full English Breakfast in place of toast. This entry was posted in Breads, Recipes and tagged Baking, Crumpets on February 18, 2015 by Sue Todd. I’ve only just checked this post out now (apologies), but guess what I’m making Kim for breakfast on Sunday morning? They look just amazing! Ha Ha, hope they turned out well. I love home-made ones. All the taste and more without the additives.